When things get too hot, Ted rocks his Titanium Marine outfit. This armor has withstood gunfire, acid, solar flares, psionic radiation, power swords, plasma cannons, Zurian butterknives and rabid blowfish during the many battles Ted has fought. The armor comes with air-conditioning, aim assist, onboard battlefield diagnostics, cable television and a built in candy cotton machine. It's time to get TITANIUM. 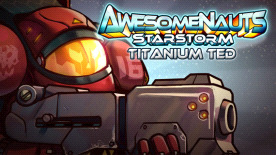 This DLC contains a custom skin for Ted McPain in Awesomenauts: Starstorm, and comes with a fully customized voice set!